Sudanese security forces used tear gas to disperse lawyers pushing for the release of activists detained during recent anti-government protests, witnesses said. The demonstration outside the Supreme Court in Khartoum was one of several staged by members of various professions, including teachers, doctors and pharmacists, following a call by the Sudanese Professionals Association to join protests that began in December. The demonstrations, often involving hundreds, have shaken the country of some 40 million people. They were sparked by rising food prices and cash shortages and have since turned against President Omar al-Bashir in office for nearly 30 years. Witnesses said more than 200 lawyers tried to deliver a petition to the head of the judiciary demanding the release of activists detained during the protests. Security forces attacked lawyers with tear gas, forcing them to disperse. There were no reports of casualties. 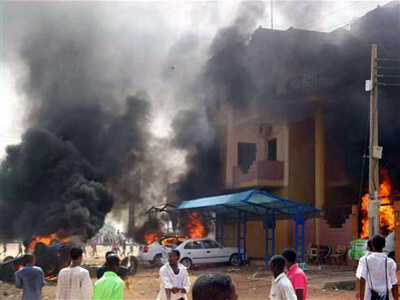 The incident happened a week after Sudan’s information ministry said the country’s security chief ordered the release of detained demonstrators. There were no reports of any mass release of detainees. In central Khartoum, security forces used tear gas against hundreds of alumni at the main headquarters of Khartoum University and at a separate gathering of school teachers who staged a vigil outside the education ministry. Witnesses said doctors at several government hospitals organised protest vigils with no reports of force being used against them. Bashir shows no sign of conceding any authority and blames the protests on foreign agents, challenging rivals to seek power through the ballot box. Prime Minister Moataz Moussa struck a conciliatory tone last week when he said demonstrators’ calls for better living conditions were “legitimate”. That listing has deterred an influx of investment and financial aid Sudan was hoping for when the United States lifted sanctions in 2017, economists say.